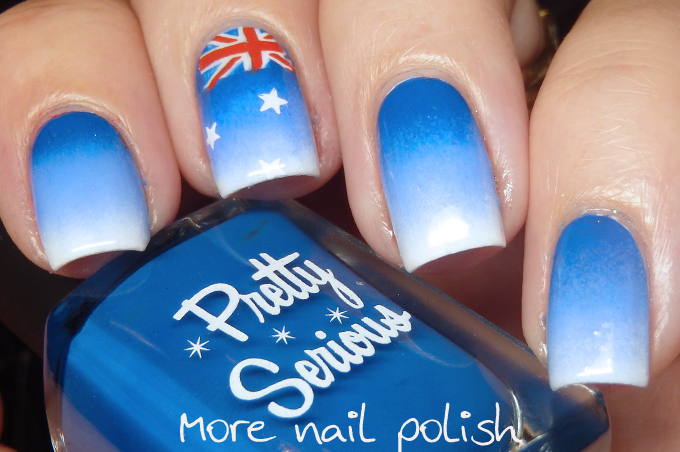 I couldn't let Australia day slip by without doing a little nail art. 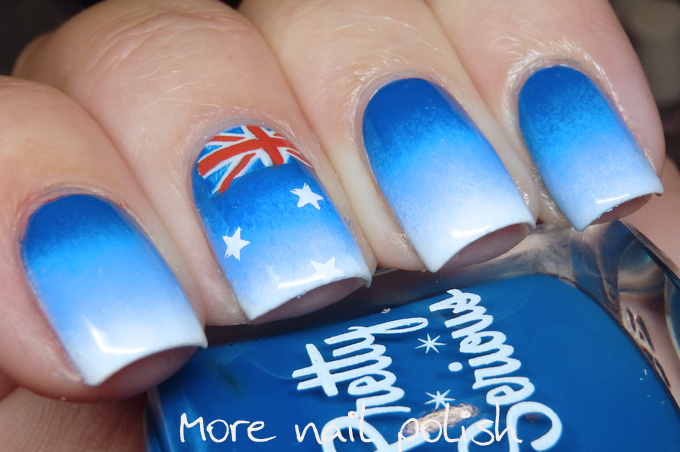 Unlike previous years where I've gone completely nuts with numerous Australia Day nail art ideas, this year there is just one, and it's pretty subtle. 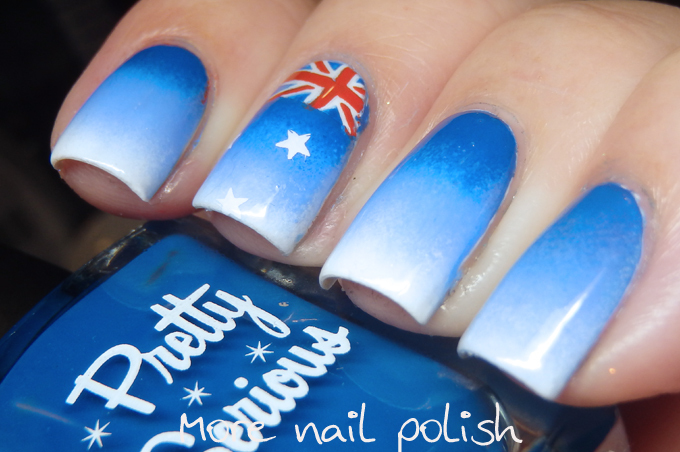 So subtle that my daughter asked me this morning why I only had the 'Australia thing' on one nail! I told her that it was all I could be bothered doing last night, but actually I really loved the simple gradient on the other nails. Last year we were luckily enough to be up in Sydney were we went to Luna Park and Wet n Wild, sadly with my stupid broken foot we aren't venturing far this Australia Day long weekend. We've decided to try get to the fireworks around the lake tonight, but so much will depend on how far I'm able to hobble around. News with my foot wasn't great last week. My surgery wound, which is nearly 7 weeks old, still hasn't healed. Doctors originally thought it was infected, but after a swab they said it wasn't. instead they said it just opened up where the stitches had been. I've had fancy silver dressings on it all this week with nurses from the community clinics changing it every second day, and it looks like it's slowly coming together. This time next week and it should finally be sealed. But the exciting news it that I get to have it all cut open again in about 2 months when they have to remove the metal plates! Anyway, enough about my foot and back onto the nails. 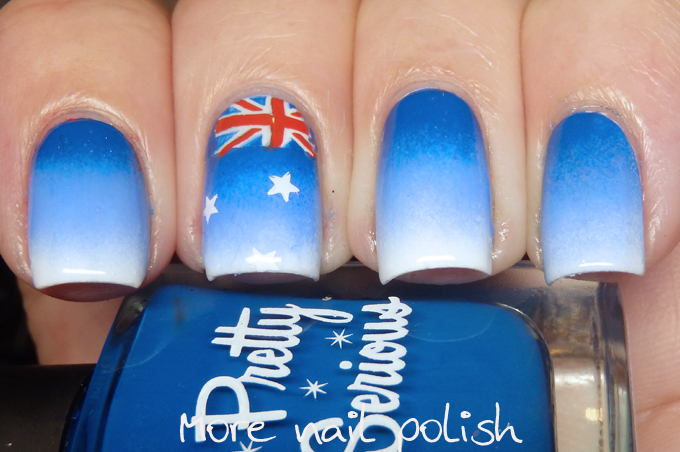 It seemed right to use three polishes from my three favourite Australian brands for the gradient. The darkest blue is Type 40 from Pretty Serious. The mid shade blue is Swagger from Picture Polish and the white is Lily white from Ulta3. I stamped the stars individually from a Bundle Monster plate and the Union Jack part of the flag was created using the ENAS stamper that I used last year shown here. Happy Australia Day to any Aussies that might be reading this, and happy Thursday to everyone else.